I'm a big fan of autumn. I love the cosy nights in and the colourful leaves. I love the fireworks and the comfort food. But most of all I love the fashion. Even though the colder weather hasn't really set in yet, I've been doing some shopping and getting my wardrobe prepped and ready. I've been stockpiling leather skirts and knitted jumpers and some pretty dreamy ankle boots - fashion is just the best at this time of year, isn't it?! I'm going to try and shoot some of the outfits I've picked up over the next couple of weeks, but for today I thought I'd share with you some of my gorgeous new autumn accessories. First up is this beautiful watch from JORD Wood Watches. I only own one other watch and it's rose gold and really summery, so when the team at JORD asked if I'd like to choose something for the new season, I couldn't resist! I love that this watch is totally unique and that I haven't seen anything similar on the high street - plus the dark wood means that it goes with everything else I've been buying. I'm also completely obsessed with this gorgeous River Island bag that I picked up on ASOS. It's basically everything I could ever want from a bag - velvet, TICK, animal print, TICK, cross body, TICK, gold chain, TICK. It's the perfect size for a night on the town and I know I'll get so much use out of it once party season rolls around. Plus it looks and feels way more expensive than it's £18 price tag. Last but by no means least are these fab boots from Primark. I knew I wanted to pick up a pair in this style for autumn as they look smart and chic, but also don't give me the impression that I will be crippled after wearing them for a couple of hours. 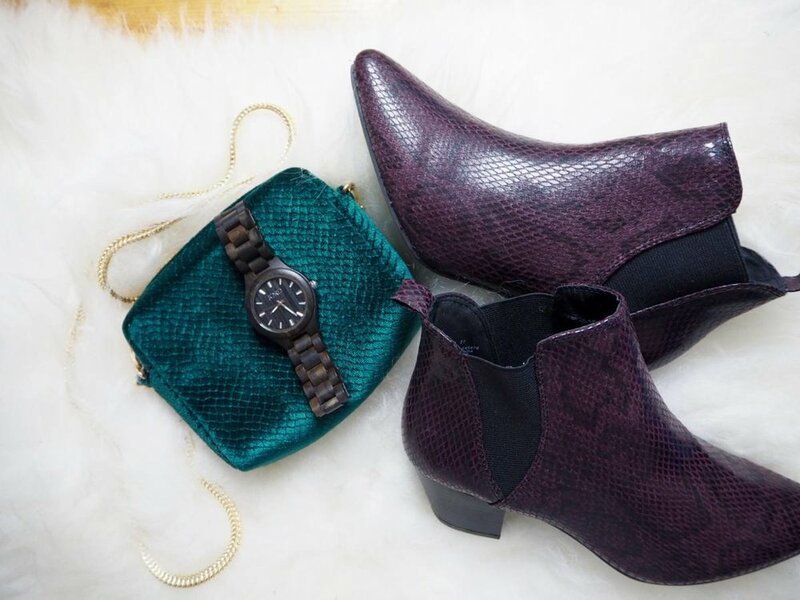 So when I saw these yesterday they were in my basket without a second thought - I am obsessed with the colour and the faux snakeskin just makes me love them even more. I've got a feeling I will be wearing them a LOT over the coming months. So there you have it - the autumn accessories that I'm absolutely loving. Have you been picking up any new bits for the new season? This watch was gifted to me by the lovely team at JORD, but all love for autumn accessories is definitely my own.